This is the second half of a 2 part of a series on basement waterproofing with epoxy. In Part 1, we discussed waterproofing block wall foundations with epoxy. In Part 2A we discuss how to identify leaks that need waterproofing in basement walls, and floors that are made out of poured concrete. In this part (2B) will deal with epoxy injection repairs of cracks in poured concrete, that cause the leaks. Earlier we discussed how many homes and businesses experience leaky basements year after year. The worse time is in the spring and after heavy rain. We discussed prudent things that you can do to improve drainage against your foundation. Epoxy Injection is designed to waterproof and give you the concrete’s structural integrity back. Why Epoxy Inject the Cracks? We discussed in our last article that cracking is a sign of failure caused by stresses, inadequate design, improper curing, etc. 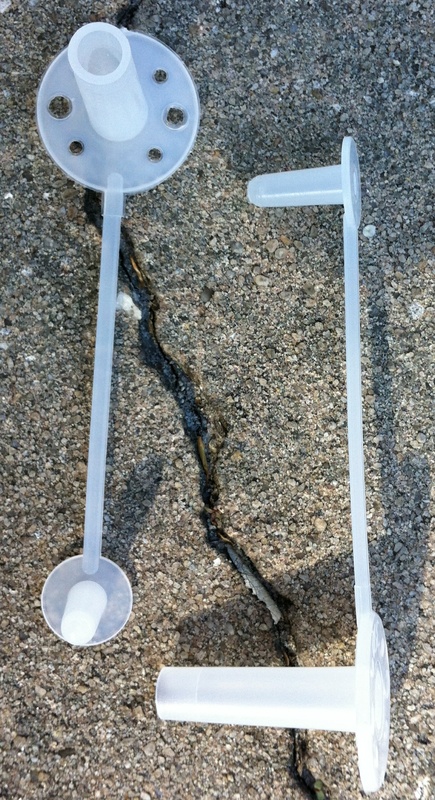 One of the dangers of a structural crack is the effect that it has on the reinforcing bar. The reinforcing represents one of the main structural values of the concrete. Cracks left unprepared allow water to enter your basement and attack the rebar. It effectively seals the crack to prevent the damaging moisture entry. Second, it monolithically welds the structure together. The injection also stops the infiltration of water into your basement. Clean the concrete on both sides of the crack being careful not to force concrete dust into the crack. Concrete dust can be detrimental to the injection processes in several ways. Vacuum the area completely with a shop vac. You need to determine the spacing of ports to be set. The spacing is a factor of the tightness of the crack and the depth of the concrete substrate. Spacing is normally between four (4) and eight (8) inches. Align ports directly over cracks. That allows injection resin to flow into the crack. Seal surface cracks and the ports in place. Sealing the exterior of cracks is done with Epoxy Gel #2006. The most economical way to deliver the epoxy injection is with the 450 ml binary injection system, a manual gun, or the pneumatically driven one. This uses a binary caulking gun with static mix tubes to inject the resin, insuring continuously mixed fresh material. Limit pressure, low pressures allow gradual resin flow into the crack for deeper penetration. Start injection at the lowest point, and continues upward on the crack area. While injecting the lowest port, resin will flow to and out of the next higher port.